The Lenovo Tab4 10 Plus is a very interesting Android tablet. Starting at 299 euros it offers pretty nice specs and up to date software. But how good is the performance especially compared to the competition? That‘s what we‘ll find out with this gaming and benchmark test. Like usually I played a couple of different games on the Lenovo Tab4 10 Plus. Obviously, simple games like The Little Fox run very smoothly and without any problems. That‘s to be expected though. More high-end games like Dead Trigger 2 run surprisingly smooth as well. I even pushed the graphic settings to its maximum and didn‘t encounter any lags while playing for a couple of levels. The graphic itself looks quite nice on the 10.1-inch full HD screen. A higher resolution would have been nice too though. I also tried Asphalt Xtreme and could play it without any big lags. Know and then you might see some very, really very small stutter. But over all, I did enjoy playing this racing game a lot here without any really noticeable issues. The same goes for Modern Combat 5 with the highest graphic settings. I did notice one lag, but it was just one. Most of the time it did run very smoothly. Lenovo is not marketing the Tab4 10 Plus as a gaming tablet but as you can see even higher end games run pretty nicely. That‘s to be expected though. The internal hardware is not high end but upper middle class. Inside runs a Snapdragon 625, at least 3GB of RAM and 16GB of internal storage. The 16GB storage might be a bit small if you want to install a lot of games. Lenovo is offering a version of this with 4GB RAM and 64GB storage though. The performance should be a bit better than on my version of it. Let‘s take a look at a couple of Benchmarks. The results are not surprising because we did see a couple of devices with the Snapdragon 625 already. It‘s good but not the fastest either. In Geekbench 4 the Lenovo Tab4 10 Plus gets 870 and 4250 points. With AnTuTu it get‘s a benchmark result of 62400. As you might have guessed, the Samsung Galaxy Tab S3 is a lot better. But it costs roughly twice as much. What‘s quite interesting though is that the Lenovo Yoga Tab 3 Plus is better in the Geekbench 3 Single-Core-Test and in AnTuTu. The prices have dropped here and both cost roughly the same. The ASUS ZenPad 3S 10 is a bit better in Geekbench 4 as well but a lot better in AnTuTu. With both competitors, you‘re getting a better build quality and a higher resolution display as well. 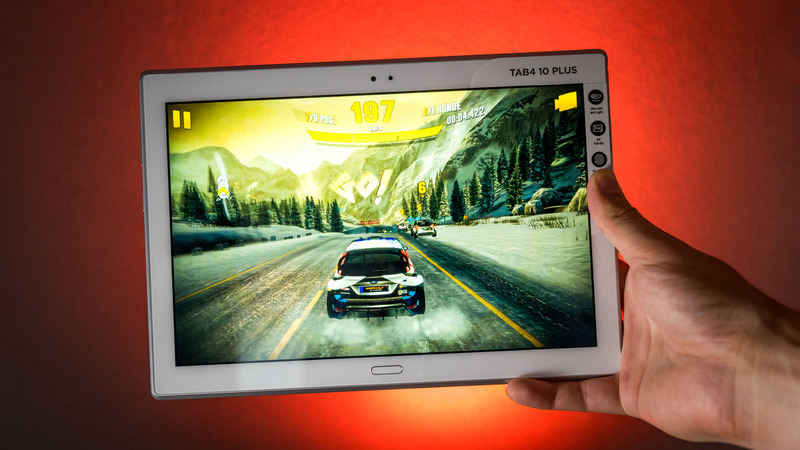 So is the Lenovo Tab4 10 Plus a good gaming tablet? Well, the performance is nice and you are able to play games like Dead Trigger 2 or Asphalt Xtreme quite nicely. It might not be the best value for your money though if you want to get as much performance as possible. Depending on where you live the Yoga Tab 3 Plus and ASUS ZenPad 3S 10 might be priced very similar. Both offer a bit better performance, a bit more storage, and a higher resolution display.